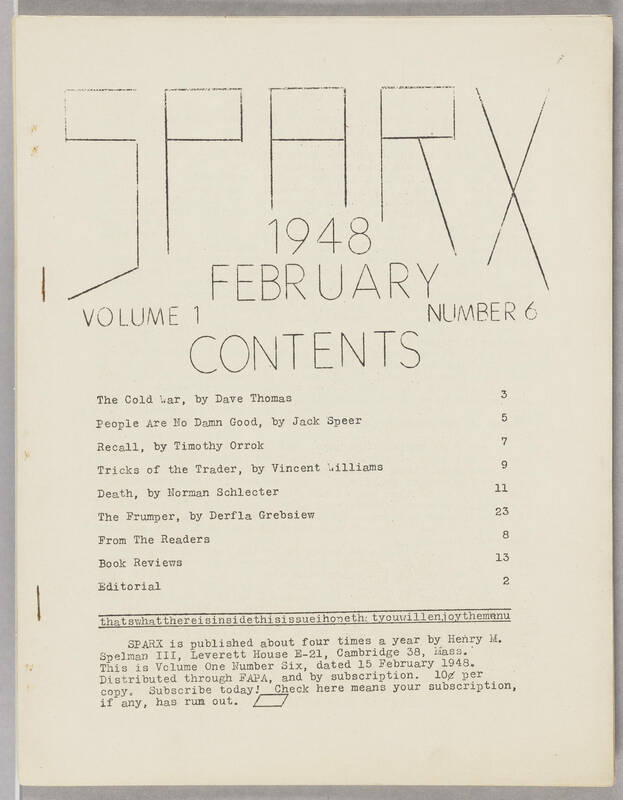 Sparx 1948 February Volume 1, Number 6 Contents The Cold War, by Dave Thomas 3 People Are No Damn Good, by Jack Speer 5 Recall, by Timothy Orrok 7 Tricks of the Trader, by Vincent Williams 9 Death, by Norman Schlecter 11 The Frumper, by Derfla Grebsiew 23 From The Readers 8 Book Reviews 13 Editorial 2 Thats what there is inside this issue I hope that you will enjoy the menu SPARX is published about four times a year by Henry M. Spelman III, Leverett House E-21, Cambridge 38, Mass. This is Volume One NUmber 6, dated 15 February 1948. Distributed through FAPA, and by subscription. 10 cents per copy. Subscribe today! Check here means your subscription, if any, has run out.